Today you can easily access to real time information from all over the world and can purchase overseas food ingredients via the internet. People can conveniently enjoy a wide variety of vegetables and food ingredients more than before. One of the vegetarian food ingredients which is currently attracting people’s attention is “agave syrup”. 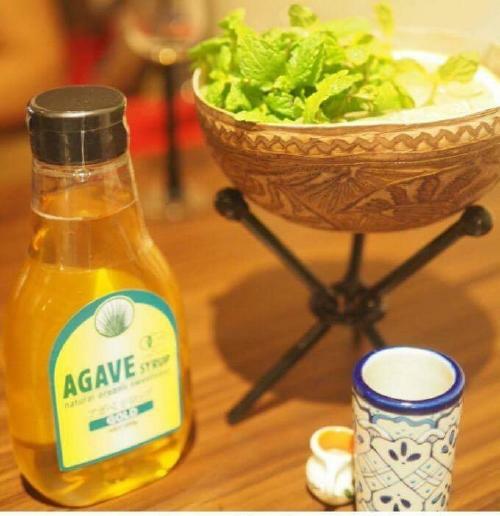 Did you know that agave syrup is made from the same ingredients as tequila? 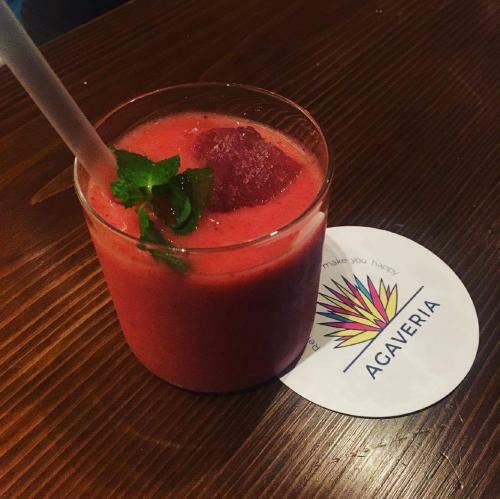 Today’s report is about a bar “Agaveria” which was newly opened in September 2017. 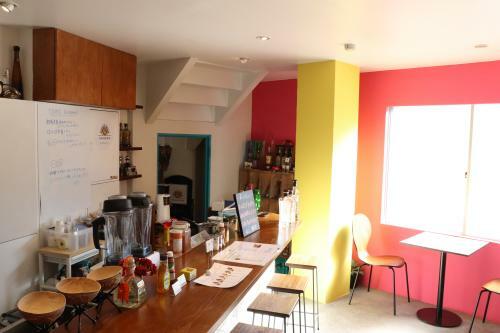 During the day it serves nutritional organic smoothies, and during the night it serves tequilas which are made with 100% agave which makes you feel fine and uplifted. 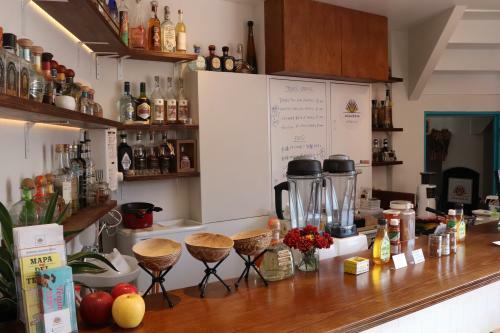 The owner of this bar is also a Yoga instructor, and during our interview she explained about her healthy approach for the body and mind through healthy drinking. Click here for location and detailed information on Agaveria. 1 The bar is situated right in front of Yoyogi station! It makes you feel like stopping to enjoy its refreshment everyday. 2 Incorporate organic food into your daily life with these easily accessible drinks! The bar is situated right in front of Yoyogi station! It makes you feel like stopping to enjoy its refreshment everyday. 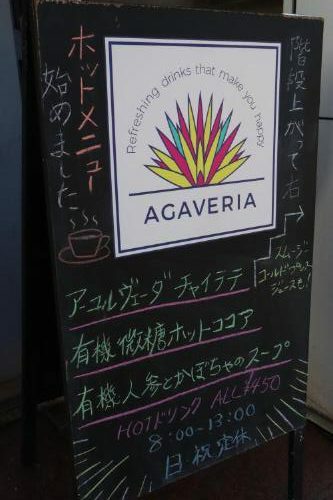 The bar “Agaveria” is situated right in front of the East exit of the Yoyogi station. As it is situated close to the station, and is surrounded by many offices, it receives many customers in the morning to buy their smoothies before going to work. When you go inside the store, the walls are painted pink and yellow and this draws your attention. It is pretty and with the bright sun light shining in, you feel cheered up just by being there! Even when you are busy, you can make a brief stop at the counter table and charge up your energy with a healthy and delicious smoothie. When you hear the name “agave”, you might associate it with “agave syrup”. It is not well know but agave is also an ingredient for tequila. This Agaveria bar was opened by Ms. Yuka Nakamura who loves tequila so much that it has become a custom for her to visit Mexico every year. When you visit the store, visitors can feel her love for Mexico. Not only tequila, the bar also serves drinks which use Mexican agave syrup. Also many items used at the store are from Mexico. 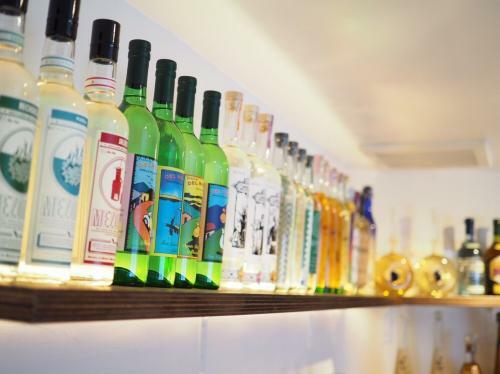 As shown above, there are many different bottles of tequila lined up and they look like an art display. Oh wow, the number of different bottles of tequila reaches over 100! Incorporate organic food into your daily life with these easily accessible drinks! The morning menu for Agaveria is supervised by the Cooking specialist Ms. Shima Hattori. 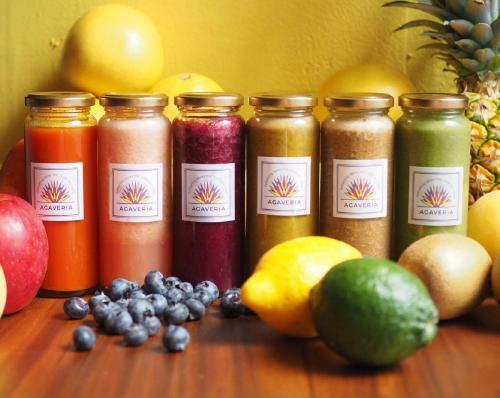 Their smoothies or raw juices (cold pressed) do not contain any sugar. Also, all ingredients are organically sourced, and they are all priced at 650 yen (inc. tax) which is a bargain price considering the ingredients. Further to that, there is a discounted coupon ticket for frequent visitors which is 5,400 yen (inc. tax) for 10 drinks. 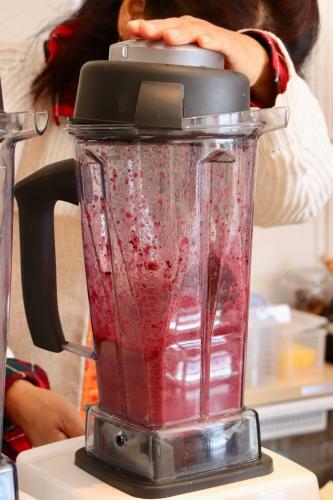 To minimize oxidation of the fruit ingredients, smoothies are prepared one by one upon order. The bar staff working during our visit had a lovely smile and made friendly conversation with us making our hearts and body feel happier. The bar staff recommended that I try an “Energy” drink as I had skipped breakfast in the morning. To improve the taste of organic bananas, they are frozen during their ripe condition which lessens the stickiness in its texture. 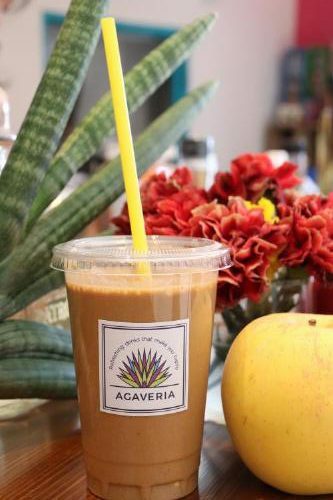 The “Energy” drink was blended with a balance of organic raw almond and whole grain coffee. It has a rich flavor but it smoothly goes into your stomach and you can feel it being soaked up by your body. The above smoothie is called “Green”. 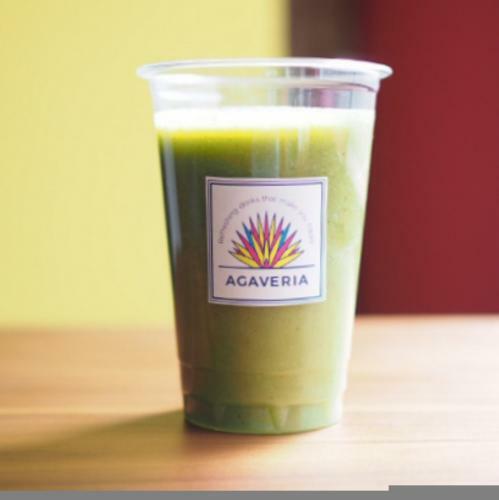 Green smoothies are quite common but this particular one from Agaveria uses organic green barley which is high in an antioxidative potency and is effective for anti-aging. Not only that, their menu includes some unique ingredients such as organic pumpkins and Kinako (a toasted soybean flour). Customers can choose their own toppings such as agave syrup, Mexican sweetener, cinnamon, ginger, etc. 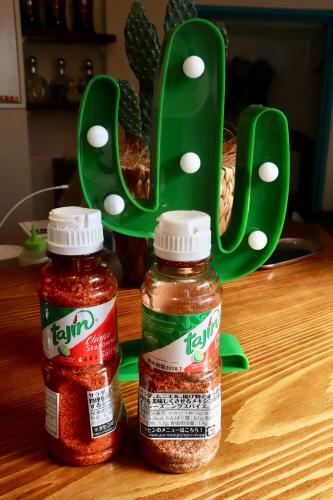 A curious and rare topping option is (above) “Tajin” which is a typical seasoning in Mexico. Tajin is made of chili, lime spice, and salt, and when I tasted it I found it was very similar to the taste of “Osyaburi-konbu” (a chewing-gum-typed kelp snack)!? It was very tasty. I recommend you try Tajin with your drink if the drink includes carrot as an ingredient. 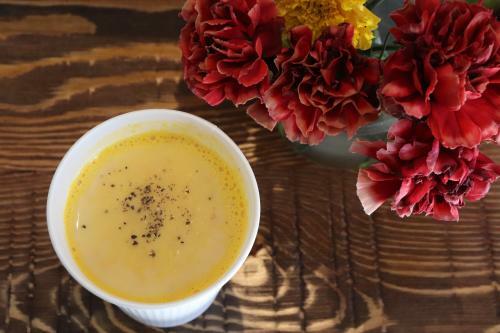 If you want to have something warm, please try the above “Organic carrot and pumpkin soup” (450 yen inc. tax). It still has the texture of carrot so that customers can take time to enjoy the ingredients of the soup. There is also a discounted coupon ticket for the soup which is 4,000 yen (inc. tax) for 10 cups. 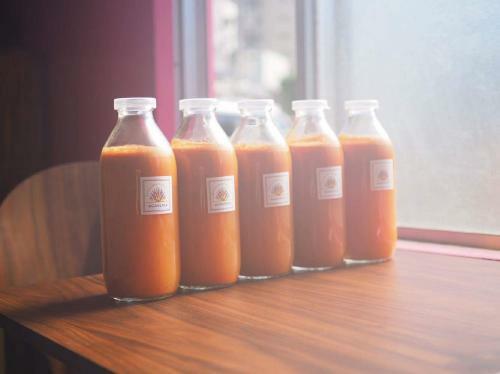 Agaveria offers a fasting program which includes 2,400 ml of organic carrot cold pressed juice (for 2 days / 6 cups a day)(7,800 yen inc. tax). The cause of aging is said to be the reduction of enzymes in the body. You can proactively take enzymes especially from raw/fresh food, as enzymes can be destroyed when food is heated at around 48 degree Celsius. The fasting program uses carrots, and it has less impact on body functions than by just only taking water, and is a more effective fasting program. This program is proposed by Dr. Yumi Ishihara who is also the author for the “Tabenai Kenko-ho (Fasting Health Management Method)”. During the night at Agaveria, they serve unique original drinks. One of them is an original cocktail which mixes smoothie with tequila.